Honda Cars Philippines Inc. has announced that their new City VX MUGEN Special Edition is now available. Honda displayed the City VX special edition with factory-installed authentic Mugen accessories in 5th Philippine International Motor Show at World Trade Center, Pasay City. The new car comes with a 1.5-liter i-VTEC engine partnered with 5-speed manual transmission. The special edition is installed with unique MUGEN front sports grille, MUGEN front and rear under spoiler, side under spoilers, and 17-inch alloy wheels with nut and lock set with a Mugen emblem. There's also 7-inch touchscreen display, audio streaming via Bluetooth, Voice recognition, USB, HDMI ports, and 3x accessory sockets inside the City. 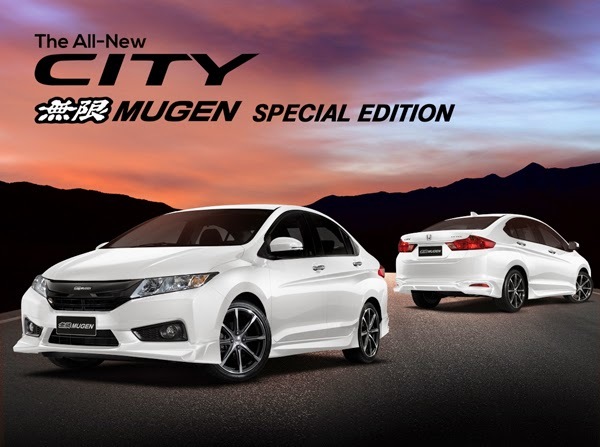 Honda also offer the MUGEN accessory package for the customer who already purchased the City for only Php 189,000 including free installation of the parts. The accessories comes in 1-year warranty.